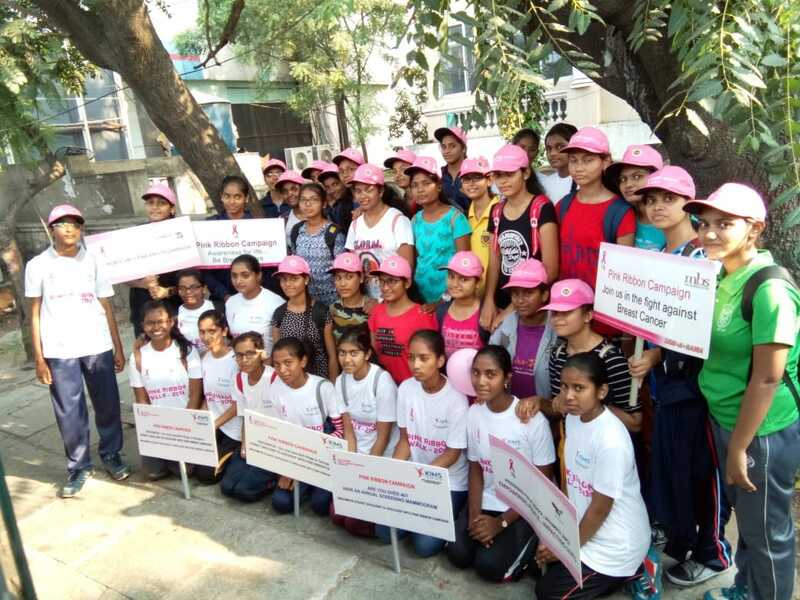 The slogan ‘DOES YOUR HEART BEAT FOR EARLY DETECTION OF BREAST CANCER?’ resonated with ‘Hyderabadis’ who extended unprecedented support to the TENTH EDITION of the 2K PINK RIBBON WALK organized by Ushalakshmi Breast Cancer Foundation (UBF) & KIMS-USHALAKSHMI Centre for Breast Disease on Sunday 30 September 2018 at KBR Park, Hyderabad. The hugely successful event was Flagged off by the world renowned Badminton player - P.V. SINDHU & BHAVANI - a BLIND LADY who conquered Breast cancer. October is world over recognised as International Breast cancer Awareness month. Established in 2007, Ushalakshmi Breast Cancer Foundation (UBF) & KIMS-USHALAKSHMI Centre for Breast Diseases has completed ELEVEN positively eventful years serving the Community in Telangana & Andhra Pradesh. Some 150, 000 new cases of breast cancer are diagnosed every year in India. With 70, 000 deaths per annum, a woman succumbs to breast cancer every ten minutes in India. In Telangana, about 7000 – 8000 new cases of breast cancer are diagnosed every year. 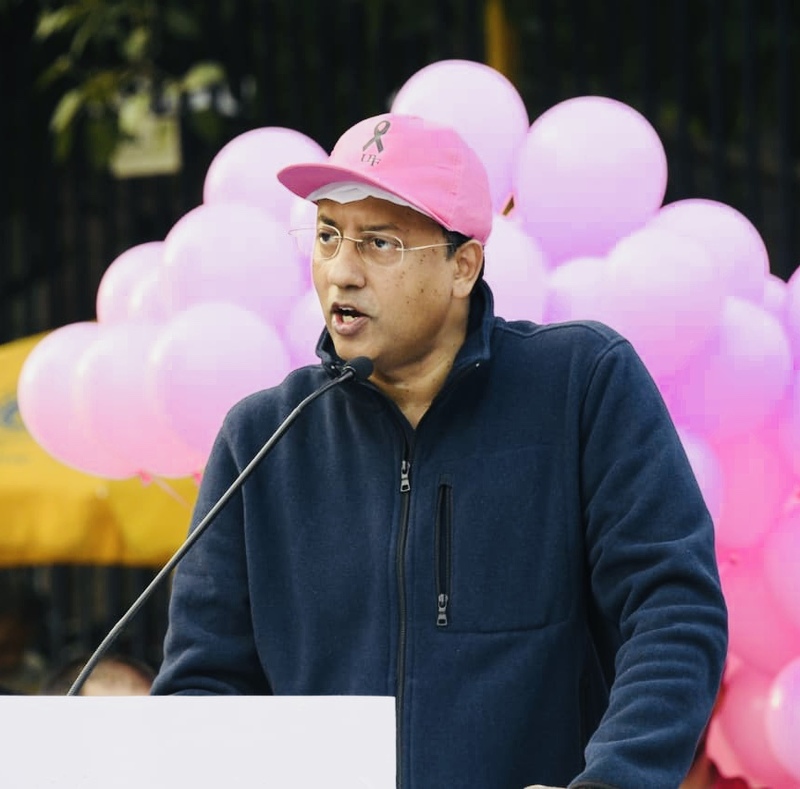 Due to lack of awareness & absence of an organized pan India population based breast cancer screening programme, more than 70% of breast cancers are diagnosed in advanced stages, with most succumbing within a coupe of years of diagnosis. 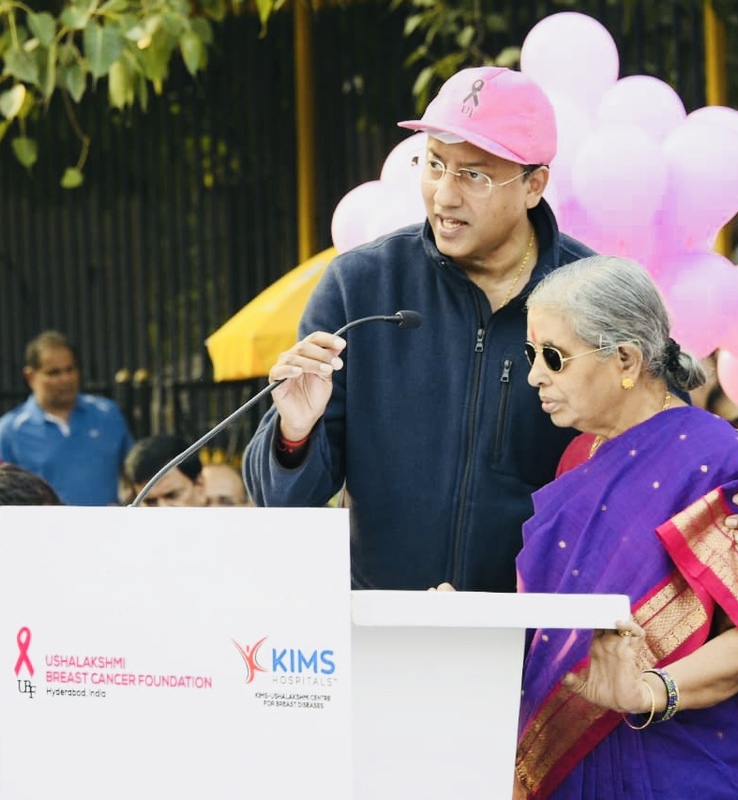 Speaking on the occasion, Ms Bhavani said that with effective counseling, remarkable surgical skills, outstanding post operative care & support from family, she conquered breast cancer. 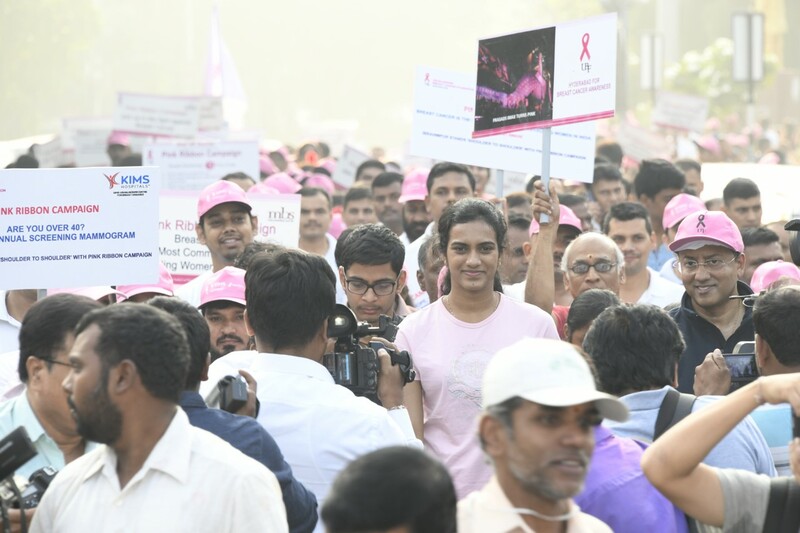 She said that she leads a normal life like any other lady and that she came all the way from Kakinada to send a positive message of Hope, Courage & survival in the fight against breast cancer. 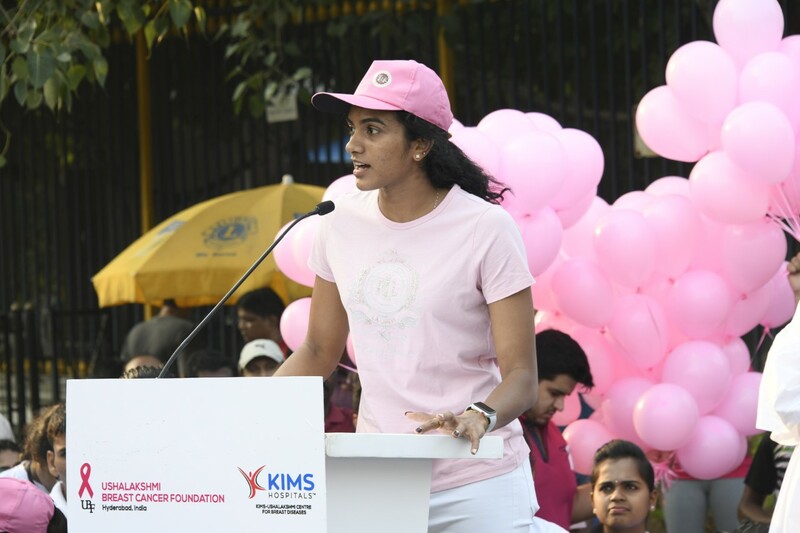 PV SIndhu paid rich compliments to Dr. Raghu Ram and the innovative initiatives championed by Ushalakshmi Breast Cancer Foundation that has helped transform breast cancer from a ‘taboo’ issue to a much commonly discussed one thus translating to ensuring early detection and saving many lives in the Telugu States. Mr Jayesh Ranjan, Chief advisor to Ushalalakshmi Breast cancer Foundation outlined the various innovative and unique initiatives being organized by the Foundation in October. 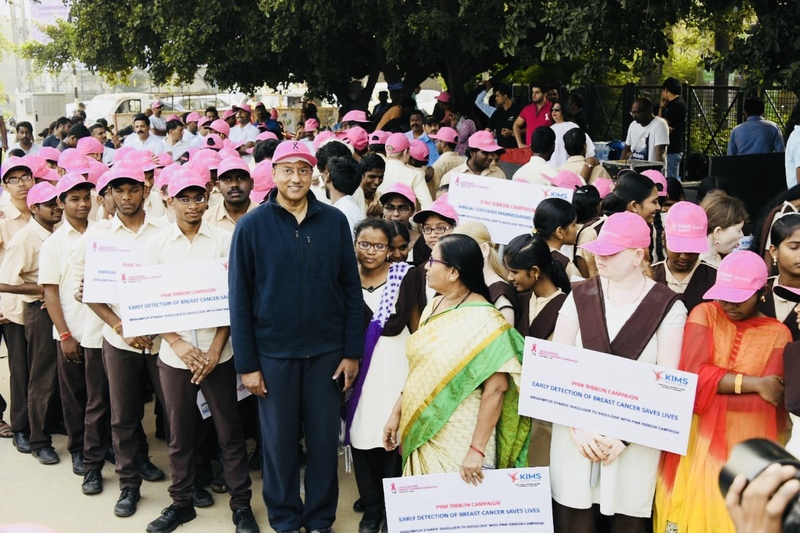 He highlighted details relating to South Asia’s largest population based Breast cancer Screening Programme that was undertaken by the Foundation in partnership with Governments of Telangana and AP between 2012 – 2017 that has benefitted over 200, 000 underprivileged women across 15 districts in both States. 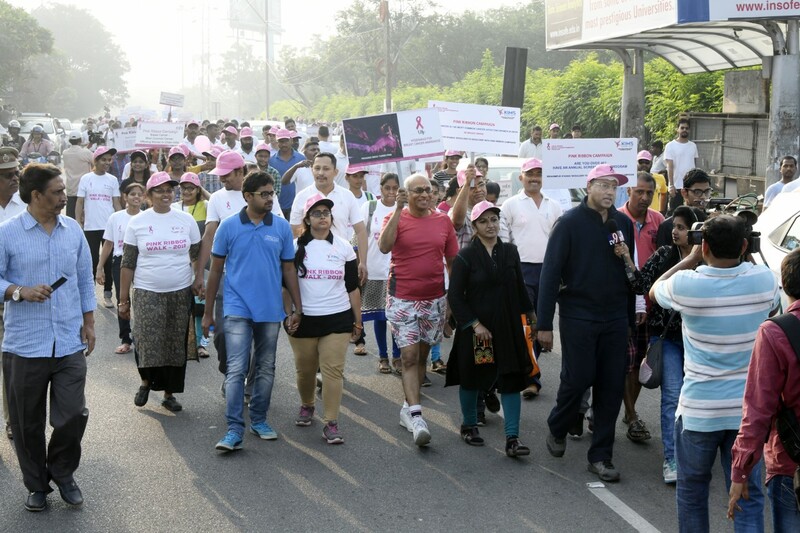 Some 3000 People from all walks of life, Breast cancer ‘conquerors’ & their families in addition to a huge contingent of blind students & Students from old city, army personnel, diplomats and whos who of the city participated, expressing solidarity with the Pink Ribbon Campaign. The aims of the PINK RIBBON WALK 2018 are to create awareness about importance of early detection of breast cancer, salute survivors in their fight against breast cancer, and equally, spread the message of hope, courage & survival in the fight against breast cancer. 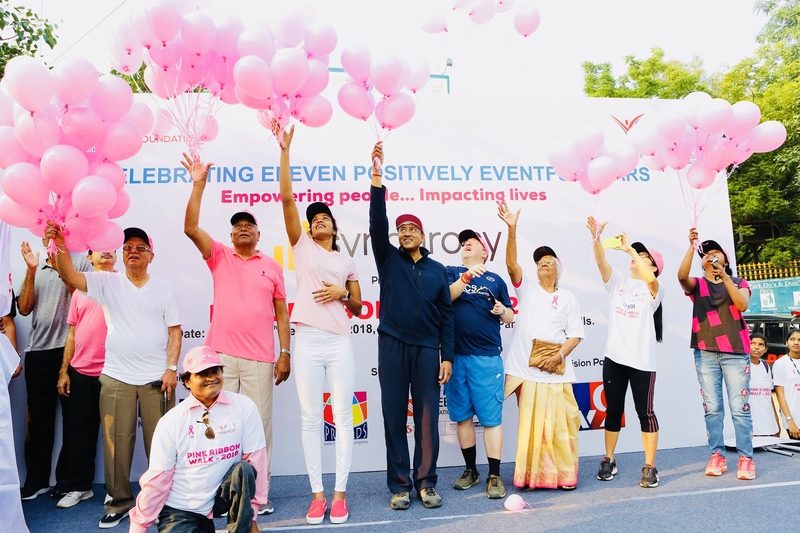 Dr. Ushalakshmi (Founder Chairman, Ushalakshmi Breast Cancer Foundation),Mr. K. Padmanabhaiah (Chairman, ASCI), Mr Faisal Uddin (Sr Vice President, Synchrony – Presenting Principal partner for Pink Ribbon Walk 2018), Mr. Andrew Fleming, British Deputy High Commissioner, Mr. Ramesh Prasad(Chairman, LV Prasad group) & a host of other celebrities, people and who's who of Hyderabad participated in the 2018 edition of Pink Ribbon Walk. In an effort to demonstrate the power of PINK (a colour that represents breast cancer awareness & salute breast cancer survivors),Charminar, Buddha Statue, Ravindra Bharati, Prasads Imax, KIMS Hospital & many other prominent buildings in the City were illuminated in PINK for a record EIGHTH consecutive year on same day of the Walk – Sunday 30 September 2018 to mark the beginning of International Breast Cancer Awareness month. Hyderabad is the ONLY city in South Asia to have so many prominent buildings illuminated in PINK, year after year, to demonstrate forcefully, the power of the PINK RIBBON CAMPAIGN.